Many texts in the Tebtunis Papyri Collection were found in the cartonnage of crocodile mummies. The majority of these texts originate from the archive of the komogrammateus (village scribe) of Kerkeosiris and date through the end of the second century BCE. Central within this body of documents are the papers of Menches, who performed the duties of komogrammateus of Kerkeosiris between about 120 and 110 BCE. Apart from the Menches papers, there are quite a few documents from crocodile mummies belonging to the papers of other Kerkeosiris village officials, such as the epistates (overseer and tax collector for the ruler) and the archiphylakites (roughly comparable to a modern police chief). Tapentos daughter of Horos, of the same village. house and other business documents. Therefore I am seriously ill, being in want of the necessaries of life and bodily . . . Here the papyrus breaks off. A separate group of crocodile mummy texts in the collection includes forty-five Greek documents, mostly private, from the first half of the first century BCE. These texts came from just five crocodile mummies that had been buried in two adjacent tombs, strongly suggesting one composite burial. Along with these Greek papyri, a few demotic and bilingual papyri were found in the crocodiles. They probably originally belonged to the priests of the crocodile god Soknebtunis, who mummified the crocodiles. The priests used their own waste papyri in the mummification process, as well as papyri belonging to other people such as Menches, the village scribe of Kerkeosiris. The priests of Soknebtunis also buried large demotic papyri alongside the crocodile mummies, possibly as offerings to Soknebtunis. 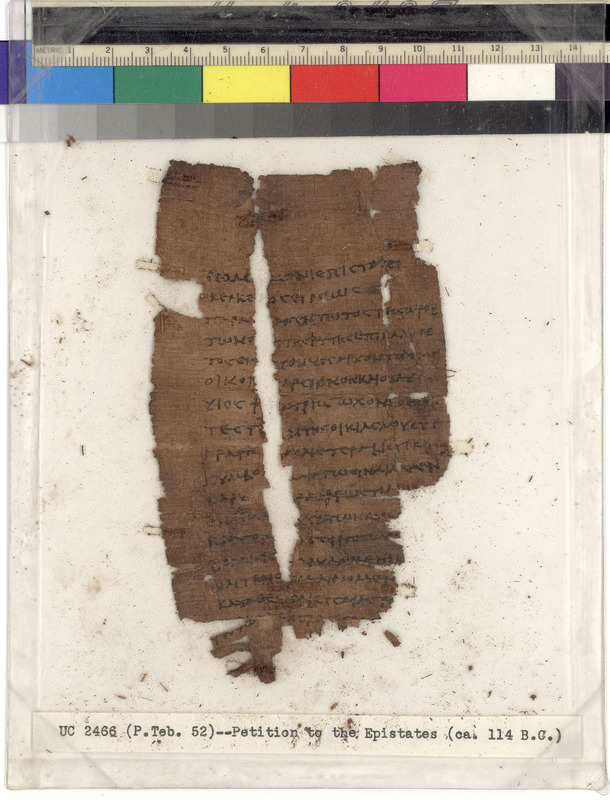 These demotic papyri contained the annual rules of the fraternity of priests.